My favourite kid is back in school. I’m going to school soon. All the family birthdays have been celebrated. My Dad was pleased with the vest. So down to business on the Nursery Block sweater. The size 4 is knit and are ready to be assembled. Now I am planning out the graphics. On my sweater I’ve knit the band plain and I’ll duplicate stitch the nursery blocks. When you get the pattern you’ll be able to choose to do the blocks in intarsia or duplicate stitch. Duplicate stitch is embroidery on top of knitting. It’s called duplicate stitch because you stitch, using a tapestry needle, another “knit” stitch on top of the stitch you knit already. Check out the tip on the tips page, which includes a video on how to do this. 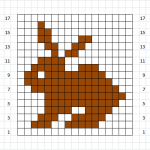 If you would like to practice before the sweater comes out, try knitting a 30 stitch by 30 row stocking stitch square and duplicate stitch the bunny. When changing colours, twist the yarns around each other to prevent a hole. When carrying the unused yarn across more than 3 or 4 stitches, carry it over the working yarn so you don’t jhve a huge big horizontal strand running across the back of the work. This is especially important in kids sweaters. You don’t want to get their hands stuck in the strands when pulling the sweater over their heads. Howling will ensue! I also ran across these two terrifc videos (one for the right side, one for the wrong side) ti help you strand the unused colour across the back of the work. Check out the pretty strawberry hat too! I’ll include these one in the pattern and on the tips page too. One of the design challenges has been to have the nursery block band come out every for every size. In children’s sizes you have relatively few stitches that you can use to adjust the pattern nicely. I’ve added some nursery block letters (do you remember? They were at the opposite end to the animals.) The letters are of different sizes than the animals and will help to space things out. The band shown at the top of the page is the resulting chart for the size 4 sweater. It’s deliberately asymmetric and I really like it. Do you? Send me a comment either way. More charts coming along with the pattern…soon I promise.